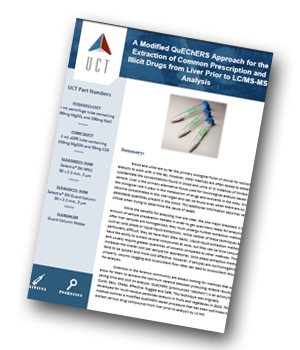 UCT has produced an application note outlining a modified QuEChERS (Quick, Easy, Cheap, Effective, Rugged and Safe) technique that has been optimized to extract common prescription and illicit drugs from liver prior to analysis by LC-MS/MS. Blood and urine are by far the primary biological fluids of choice for toxicology analysts to work with in the lab, however, liver is the primary alternative tissue based on the biological role it plays in the metabolism of drugs and toxicants in the body. While the benefits for analysing liver are clear, the one major drawback is the amount of sample preparation needed in order to get specimens ready for analysis. This method outlines a modified QuEChERS based procedure that has been optimized to extract various drug compounds from liver prior to analysis by LC-MS. Excellent recoveries were achieved for the range of analytes included in this study. Recoveries were evaluated by fortifying samples at two varying concentrations. On average, the recovery for samples spiked at 75 ng/g was 81 % and for samples spiked at 300 ng/g it was 83 %. Recoveries were calculated by dividing the chromatographic peak area of samples spiked prior to extraction by the peak area produced by samples that were spiked into a pre-extracted blank matrix. Samples are extracted with unbuffered QuEChERS salts followed by dSPE cleanup of the supernatant using C18, yielding a clear extract. Analysis is performed by LC-MS/MS using a Selectra® DA HPLC column. The QuEChERS method described is shown to offer new advantages to the forensic toxicology community when overcoming complex matrices.